Scroll back to a month ago, a tired and weary Emma was nosying through her endless Instagram feed, and something kept constantly catching her eye. This was the beginning of the wave of the shoulder barer. Not only had I recognised the trend through the budding bloggers I endlessly stalked, but it’d transformed to the brands too, with Topshop, Missguided, Boohoo and more, all offering the lower end, affordable and beautiful item to wow everyone. Including all you Instagram stalkers(wink, wink). To some, these items offer a reminder of their youth, allow them to re-create a certain style or affix it into a new one. Whether it be a dress or top, varying lengths of the shoulder barer allow it to be transferable from day to night and casual to chic. 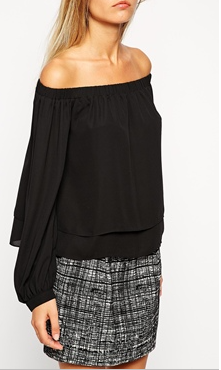 Black shoulder Top-For day, wear with: Denim cut offs, white converse/plimsolls , thick chain and side shoulder bag. Black shoulder Dress-For night, wear with: Coloured pointed heel, soft & dainty necklace, leather biker jacket and large bright, clashing clutch. The race to find the perfect shoulder top is on, with many stores outselling by the minute (Asos for example). This chase for the shouldered item, which will transform your wardrobe is well and truly over the starting line, therefore- Ready, set, GO! Writing for Amor magazine on a weekly basis, allows me to express, review and create articles on pieces of beautiful fashion. Be sure to read both here and Amor! Next Post Not wanted at LFW? It’s okay, there’s only a bloody weekend!